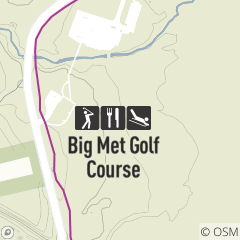 Challenge even the best player at the scenic Big Met Golf Course. Schedule your next golf outing today. Big Met Golf Course (originally named Course #1), believed to be Ohio's most played golf course, has hosted over 6,000,000 rounds of golf since it opened in 1926. During the "Golden Era" of golf in the early 1920s, the sports director of the Cleveland Press, Rodney C. Sutton, proposed that the Cleveland Metropolitan Park Board build a golf course in the Rocky River Valley. Local golf enthusiasts persuaded the board that golf was a growing sport and that a "Pay as you play" course was needed and would be supported. The original course design was completed by Stanley Thompson and has since undergone several major changes. In 1950, the original small clubhouse was replaced with the current clubhouse to allow for more parking. When Big Met opened, golfers traveled to the course by various modes of transportation including streetcar, foot, and horseback. In 1964, a fairway irrigation system was installed and in 1967, holes #7 and #8 were lengthened and remodeled. A dominant characteristic of Big Met is the dike which helps hold back the Rocky River and can be seen from several vantage points. With gentle rolling hills, moderate length, eight sand bunkers, and neatly trimmed rough, Big Met Golf Course has the ideal blend of scenic beauty and playability, yet the course is challenging enough for the advanced player. Play "ready golf." Be prepared for each shot and keep up with the group directly ahead. Cleveland Metroparks par time is 2 1/4 hours for 9 holes and 4 1/2 hours for 18 holes. Approximately 15 minutes per hole. Replace divots, repair ball marks and rake sand traps. 18-hole players should break for only five minutes upon completion of the front nine. A longer break could result in the loss of access to the #10 tee. Cleveland Metroparks offers Solorider golf carts, single-rider golf carts designed for individuals who need mobility assistance on the golf course. The car is designed so that the golfer's handicap will only be related to his or her ability to play the game, not any mobility impairment they may have. These Solorider golf carts are provided at regular cart fees to individuals with disabilities at Shawnee Hills, Seneca and Big Met golf courses. No reservations are necessary, but are strongly recommended so that the carts are ready when you arrive.